The MV-22 donned a Bambi bucket and put on a water dropping demonstration at Hemet-Ryan Airport in February for California Department of Forestry and Fire Protection and U.S. Marine Corps officials, and everyone walked away impressed. Now the $72 million tilt-rotor transports will be on call to support Cal Fire operations starting this May. The USMC Ospreys will be reserve assets that will be called up only after all of Cal Fire’s other assets are maxed out. They will use a 660 gallon Bambi bucket (twice that water of a twin-Huey) attached to a 100 foot-long tether to get the job done. The downside to the Osprey is the massive amount of downwash that the Osprey puts out, a characteristic that is already notorious within the Osprey community. As such, the 100 foot line is necessary to mitigate the bucket’s stability during drop operations. 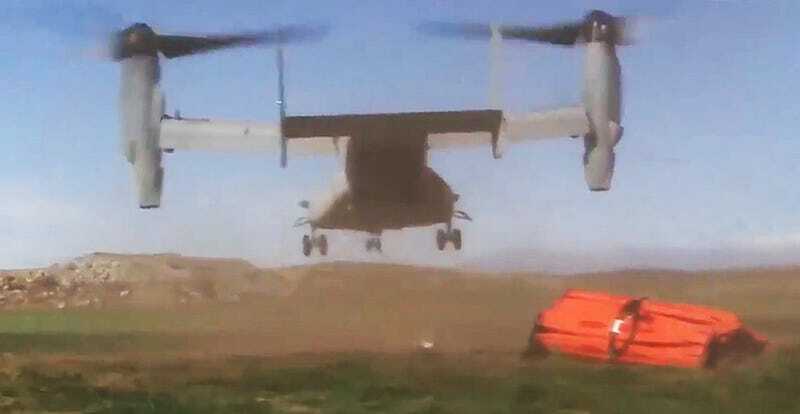 The Osprey also has to keep 70 feet between the ground and the bucket due to the possibility that its powerful rotor-wash could actually spread the fire if it were to make drops any lower. The Osprey’s baseline firefighting capability is not necessarily new. It was pioneered by Marine Test Squadron VMX-22 back in 2011. You can see the full slide-show presentation on the program here. During the test program a 900 gallon bucket was also tested. One advantage the Osprey offers to fire fighting operations is its speed, as it can deploy quickly throughout California and operate at greater distances from basing than a standard helicopter. Also it brings a lot of capability beyond water dropping. This includes deploying Smokejumpers and lugging cargo and personnel around the area of operations. The MV-22's extremely hot exhaust is also a concern for Cal Fire’s leadership. With this in mind, they will be kept from operating out of improvised landing zones. Instead Cal Fire sees the MV-22s operating out of improved airfields exclusively. All types of military transport and utility aircraft have been used in the past to lend a hand fighting fires when necessary. The USMC’s CH-46 Phrog was well known for its bucket bombing prowess before its retirement and replacement by the MV-22, so the Osprey has some big rotors to fill when it comes to aerial firefighting. Regardless of its capabilities and limitations, the Osprey’s recruitment into fire fighting service is a reminder of how America’s military can do so many other things than just combat.